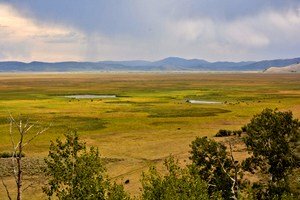 In about 1811, the Wilson P. Hunt Overland Party became the first white men to explore what became known as the Grays Lake area. What they found was an incredible resource; a shallow lake/marsh teeming with beaver, muskrats, ducks, geese and cranes and a host of other wildlife. Even by the late 1800s, pioneers traveling on the Lander Cutoff of the Oregon Trail noted in their diaries the abundance of wildlife in this pristine lake. It was considered to be one of the most important waterfowl habitats in the West. These early explorers and pioneers likely wouldn’t recognize Grays Lake as the same place today. It is still a peaceful quiet valley with only a handful of residents who must travel 30 miles to Soda Springs or 40 miles to Idaho Falls to find services. Agriculture is prevalent nowadays, but that really isn’t what drove the change, at least locally. The real change came in the early 1900s. Developer Barzilla Clark (who later became the 16th governor of Idaho) purchased all the water rights to the lake: a whopping 200,000 acre-feet, far more than the system produces. By 1924 he had completed a canal draining from the south end of the lake. Now, instead of flowing north through the Willow Creek drainage, Grays Lake water drained south, into the Blackfoot drainage where it ended up on farm fields at Fort Hall. This change dramatically impacted Willow Creek and the lake itself. According to USGS records, the average lake water depth in the spring is 11.5 feet, but after the May irrigation call, average water depth drops to less than a foot in six weeks. And that is why those fortunate enough to see Grays Lake before it became Grays “Marsh” would be challenged to recognize it. Since 1965 a portion of the area has been managed by the US Fish and Wildlife Service as the Grays Lake National Wildlife Refuge. However, it appears to be a case of too little, too late. At one time, the lake supported hundreds of thousands of waterfowl. Now it annually produces 5,000 ducks. Even into the early twentieth century trappers were able to take a sustainable harvest of 40,000 muskrats a year. But without adequate water going into winter, muskrat populations dwindled. Indeed, it is challenging to manage a marsh when you don’t own or even control the water. Even in its wounded state, Grays Lake is still known for two things: First, at 22,000 acres it is the largest hardstem bulrush marsh in North America. Second, it is the home of the highest breeding density of sandhill cranes in North America. Those are two continental scale values. Even in its water starved state, Grays Lake provides critical habitat on a continental scale. Just imagine what it could produce if more water could be left in the system!